FORT LEONARD WOOD, Mo. (June 10, 2010) — Regional military officials have relieved Col. Judith Ruiz of her position as commander of General Leonard Wood Army Community Hospital. The decision was made Sunday and publicly announced Thursday by officials of the Army’s Western Regional Medical Command, in response to media inquiries from the Pulaski County Daily News. It’s not clear whether the decision had anything to do with a local uproar that followed a false report issued by post officials and widely circulated via e-mail, community message boards, and family readiness groups that eight local restaurants had failed their health inspections. That report has since been retracted and post officials have made clear that there is no list of restaurants barred from receiving unit funds based on failed health inspections, or for that matter, any other reason. Multiple sources indicate that other senior officers at Fort Leonard Wood have also been replaced, but there’s been no official confirmation of that from military officials. Some of those officers are in positions not likely to have been related to the false food inspection reports. Ruiz had been at Fort Leonard Wood since August 2008 and been scheduled to move to her next duty assignment shortly. The interim hospital commander will be Col. Paul Kondrat, senior nurse executive for the Western Regional Medical Command, who will serve until July when Col. Kirk Eggelston arrives to take command. 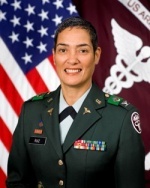 Ruiz has previously been the deputy director of the Surgeon General Rehabilitation and Reintegration Proponency Office, and she’d been an Army nurse since 1984. She and her twin sister both rose to the rank of Army colonels. This isn’t the first time the Fort Leonard Wood’s hospital has come under fire during Ruiz’s tenure. Shortly after Ruiz assumed command, her hospital became the target of national media criticism when a drug counselor formerly employed at the hospital filed an official complaint accusing Ruiz’s predecessor, Col. Theresa Sullivan, and the director of the hospital’s drug treatment program at that time, Capt. Melissa Lee, of intentionally diverting soldiers away from drug treatment to eliminate long waiting lists for soldiers that had generated criticism by the hospital’s accreditation team the previous year. Long waiting times for drug and alcohol treatment have become a problem throughout the Army and aren’t limited to Fort Leonard Wood, but Fort Leonard Wood has particularly difficult problems recruiting civilian medical professionals due to its isolated rural location. After an internal Army investigation ordered by the post’s commander cleared the hospital of wrongdoing, the drug counselor took his case to U.S. Sen. Claire McCaskill, a member of the Senate Armed Services Committee who in an earlier visit to an American Legion post near Fort Leonard Wood, had pledged to listen to complaints and said it would be “fun” to force top Army officials to answer questions. Another visit by the Joint Commission on Accreditation of Healthcare Organizations was conducted at the post hospital from April 20 to 22 of this year. Details on that visit are not yet available.